Witness statement: At approx. 3:45 pm, I was at my home, watching the HD Earthviewing camera from the ISS. The approximately 6-7 discs were immediately noticeable, as this is a familiar view that I watch frequently. I did not know exactly what the objects were, just that I had never seen them before. Original screen shot image including two enlarged images of the objects. I had prepared my lunch and just sat down to eat when I focused on the screen, upon which I nearly threw the plate in the floor. I grabbed the laptop and did the screen shot, as the objects were already recessing away into the darkness. I quickly showed the screen to my oldest son, who was sitting next to me when this happened. This is as best as I can remember what happened: The ISS had just passed over the southern tip of Peru (I also had loaded the ISSTracker-Real-Time), and was out over the Atlantic. The camera had been cutting in and out, and when it came back on, the objects were on-screen. I did a quick screen capture. There is one disc that is readily visible, with a half-circle of 5, fainter discs and possibly one more off to the right of the half-circle. The best visible one (closest to the ISS) appears to be soft orange in color, the remainder of the objects are faint enough that the color is not apparent. All the objects appear to have domes. Part of the ISS is clearly visible on the right and the Earth visible at the bottom of the image. There are smudges on the window where the camera is located--these are visible whenever the light from the sun is located appropriately--these tiny smudges are also grouped on the window towards the right of the ISS. 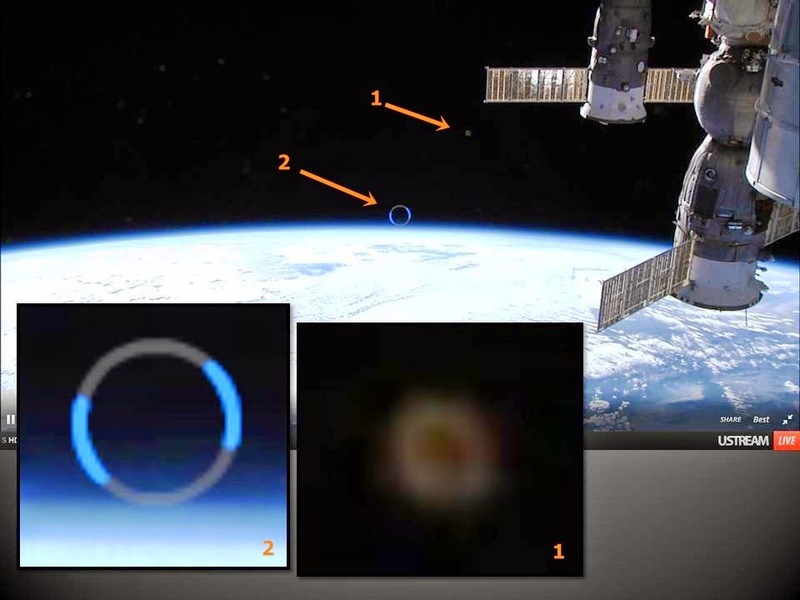 The discs did not remain visible more than 15 seconds, as they slowly faded back away from the ISS, and never broke the formation they were in when sighted. This remarkable event was reported to Mufon - case 59771.